Glasgow Anarchist Federation are are very happy to be involved with bringing JoNina and Lorenzo Ervin to speak here in a couple of weeks time. 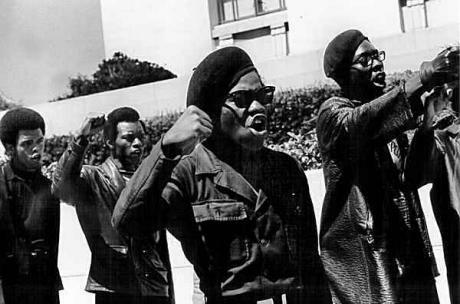 The Black Power movement in the United States superseded the Southern Civil right movement with more movement ideology, strategy, and tactics, which provided even more of a confrontation directly with the American central government. More than just a Black cultural history of the period, and speaking of the usual media creations that dealt with poetry, Afro hairstyles or Black music of the late 1960’s into the ’70’s, Lorenzo and JoNina Ervin, two African American veterans of the U.S. Black Power movement, speak of now-forgotten radical movements from that period: the Student Nonviolent Coordinating Committee, the Black Panther Party, League of Revolutionary Black Workers, and others which made up a radical activist wing, which tried to transform the entire country, not just protest racism or seek Black rights with protective legislation. Learn about the radical wing of the Black Power movement, from the standpoint of the grassroots participants, not the leaders. JoNina Ervin, author of “Driven by the Movement: Activists of the Black Power Era”, will speak about her interviews with some 20 Black Power activists as well as about her activity in the Black Panther Party in the 1970’s. Lorenzo Ervin, author of “Anarchism and the Black Revolution”, “The Progressive Plantation”, and “Black Power, Black Autonomy” is an ex-civil rights and Black Panther Party member will speak on his years as a civil rights/Black Power activist, Black Anarchist political prisoner, and contemporary anti-racist organizer. They are both active in the Memphis Black Autonomy Federation, and on the national board of the Black Autonomy Federation of North America.